The Center on Disability is committed to ensuring that our site is accessible to everyone. If you have any questions or suggestions regarding the accessibility of this site, please contact us. We want to maximize the experience of all of our visitors. If for any reason you cannot access any of the material on our Web site, please contact us. This site adheres to the newest web standards, and seeks to achieve superior user experiences. The current highest standard for website validation is XHTML 4.01 Strict, and CSS 2.1. You will find consistent global navigation links throughout our site. All pages on the site have a search box to assist in finding specific information. Links have title attributes which give the user more information about the associated information. Links with the same link text always point to the same address. Links open in the same window except for non-web documents. 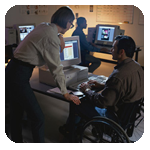 The Center on Disability will always provide non-web documents in a new browser window. W3 Accessible Techniques, which explains how to implement each guideline.